Having problems setting up your CRT projector? Watch a pro do a setup from start to finish on this CRT Projector Setup Guide! Looking for the ultimate in performance? Add a high end HDMI input card specially made for the Sony chassis! 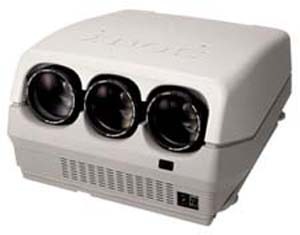 In 1997 Sony revamped their entire CRT projector line-up from scratch and introduced the D50 as the entry-level projector (along with the higher end G70 and G90 models). The D50 are small and quiet sets with 7" ES focusing tubes, 800 lumens, digital convergence, on screen menus (and lots of built-in test patterns), video, s-video and component inputs. 64 Khz scan rate makes them 720p/1080i (HDTV) compatible. To see how this projector ranks in relation to other projectors for use in a home theater environment see the Projector Rankings page. For full specifications on this and other projectors, see the Projector Specifications page. For an overview and history of Sony see the CRT Primer. See the Advanced Procedures page for various DIY instructions on maintaining and improving CRT projectors.